Dear ASI Enthusiasts, Supporters and Volunteers, Greetings and Happy Holidays! 2014 was a busy year for ASI and we are ready to move forward with new workshops, community cleanups, many new and returning partners and exciting programs for inner-city kids and communities. As an example, we just recently created murals and art programs at the Adaire School with 400 students! This could not have happened without the over 700 volunteers who help us with everything we do – from providing legal advice, to raking trash, to the teachers who work with youth. Although volunteers help keep our operating costs very low, we still need your help in maintaining our important work in disadvantaged neighborhoods and with at-risk children. Please consider making a gift in any amount to Art Sphere Inc. We appreciate your help! 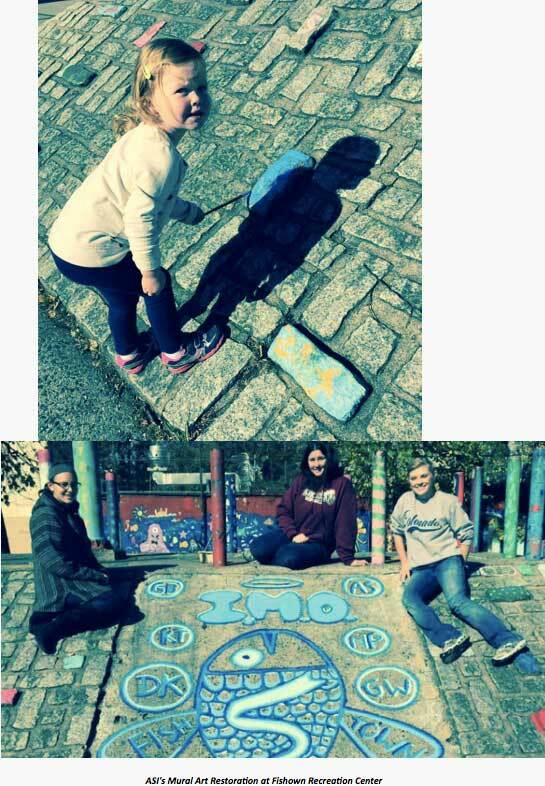 Paint a Park with us in the Winter! 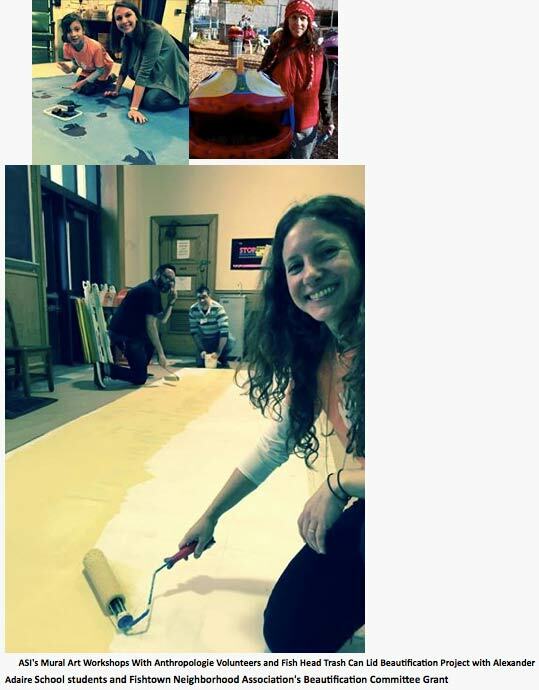 Monday, Jan 19th, 10:00am to 1:00pm -“MLK Day of Service” Join us at Fishtown Recreation Center (1201 East Montgomery Avenue, Philadelphia, PA, 19125) for art workshops with opportunities to make stencils, explore mural painting, make cards for seniors and soldiers, and assist with park clean up. Contact us for more information or learn more and sign up at www.volunteermatch.org/ or MLK Day. Arrange a volunteer event for your group at one of our partner sites inside Or in the Spring! On your Mark and Get stARTed! 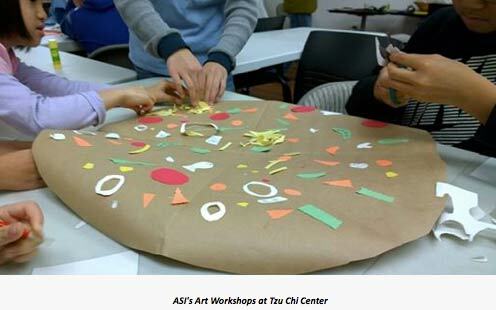 Join us to help teach our art classes this fall and winter at the Tzu Chi Center in Chinatown, starting January 4 (for 10 consecutive Sundays 11:30 a.m. – 12:30 p.m.) with our Compassion Through Art program. The age range of the participants are elementary through middle school youth. Or join us at the Fishtown Recreation Center, on January 15 (for 10 consecutive Thursdays 10:00 a.m.-11:30 a.m.) in Fishtown with our Minnow Art Preschoolers Program. January, Date TBD – “Winter Bird Count for Kids” at John Heinz Refuge – ASI to lead a volunteer walk and then complete nature related artwork around winter birds and their habitat. Email info@artsphere.org for more information. At our Studio, Saturday, January 24, 12 noon-1 p.m. and learn more about our programs. 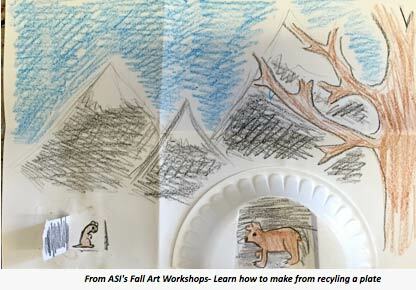 January 31st, 9:00am to 1:00pm – “Groundhog Day Festival” at John Heinz Refuge with ASI leading a volunteer groundhog related artwork celebrating the changing seasons. Meet Art Sphere Inc. Volunteers! 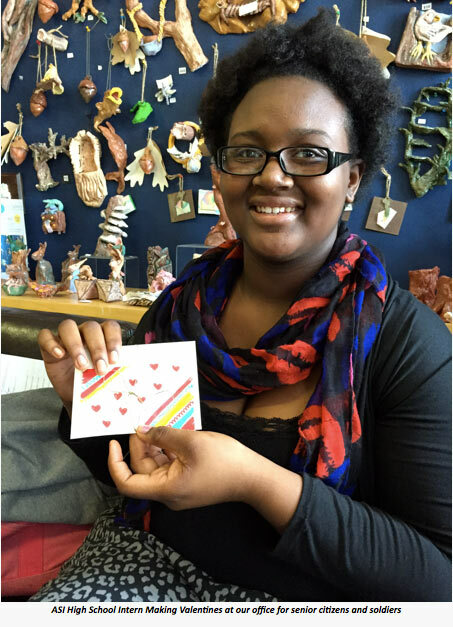 Celebrating The Heart With Art at our office at 915 Studios on Saturday, February 6, 10 a.m. – 12 noon. Learn how to make fun and easy valentine projects that celebrate love and help us give them to our Senior citizen neighbors at Tucker House and Friends Guild House. Have a HeART … Share ART! It’s never been easier to share a smile with someone and share a love of the arts to continue a legacy of creativity. Amazon.com has found a way to merge shopping and giving in the best way. Go to www.smile.amazon.com. Find the “Pick Your Own Charitable Organization” section and select “Art Sphere Inc.” as your charity. Our project for your donations will be to provide inner city kids with art materials to be creative at home and at school. We gave out 100 art boxes this summer and need your help to give out 1000 more! Boxes included: Fiskar scissors, Crayola watercolors, markers, colored pencils, crayons, number 2 pencils, erasers and pencil grips, Elmer’s Glue bottles and glue sticks and ideas with instructions to help the young artists continue their creativity at home. From all of us here at Art Sphere Inc., we appreciate your support and for sharing our message. Visit artsphere.org and Artsphere on Facebook for the latest updates and information.